Touring around Beijing, you'll see lots of modern hotels. Have you thought of staying in Siheyuans? Hiding in Hutongs, the Siheyuan hotels have red walls, old chairs and embroidered pillows, all those reminding you that here is Beijing, a modern city with long history as well. 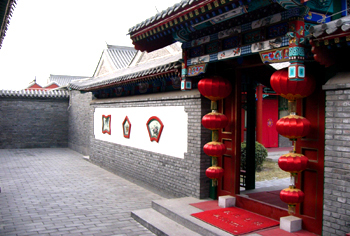 It is normal for a Siheyuan (courtyard) has four rooms positioned along the north-south, east-west axes. The room positioned to the north and facing the south is considered the main house and would traditionally have accommodated the head of the family. The rooms adjoining the main house are called " side houses" and were the quarters of the younger generations or less important members of the family. Those Siheyuan hotels listing below make experience old Beijing life style. Having a big front yard and quiet back yard, Haoyuan is a typical Siheyuan. In the front yard there is stone chair under a giant tree. Sitting there in the sun, you'll feel warm thought it's still winter. There are single rooms, double rooms and suits in Haoyuan. Every room has wooden chairs and the wooden windows are decorated with paper-cut. In the afternoon, sunshine will penetrate into the room through the window. Haoyuan has started receiving foreign guests ever since the early 1990s and part of the hotel's annual turnover has been contributed to charity organizations. 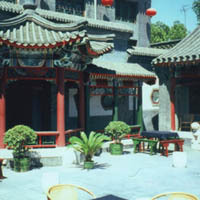 The dining department at Haoyuan serves both Chinese and Western breakfasts and also provides courtyard barbeque.